Patra's Other Place: Many versions of friendship. What makes a best friend, or even a good friend? When I was a child in school, one had to have a 'best friend' to hang around with. I had several best friends over the 12 years I was at school, and I can still remember most of them, even though there are only two that I am still in touch with. I don't remember what attracted me to these various friends at the time, but the two I still connect with share similar interests with me. 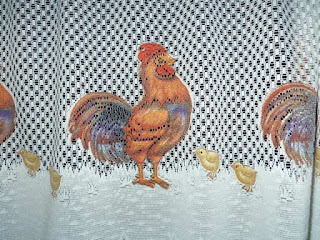 My other friends at this point in my life are mostly those who I have met through shared interests such as needlecraft and other craft hobbies, while some are neighbours and other people that I simply like to spend time with. It would be very difficult for me to choose one as a best friend because they all give me so much of themselves, and I hope I do the same for them. I am sometimes surprised at the variance in ages - some of my friends are many years younger than me; in fact their mothers are my age! It feels quite strange to be in the company of people my age that I feel are 'older' because their kids are my friends! One such friend is Cheryl, who lives about 20 minutes drive away. She and her family live on several acres and have dozens of hens and roosters as well as two dogs, two cats, as well as a horse and alpacas. Ken and I love to visit them! Cheryl works full time as well as looking after her family and the house and property, but she still finds time to do things for her friends. 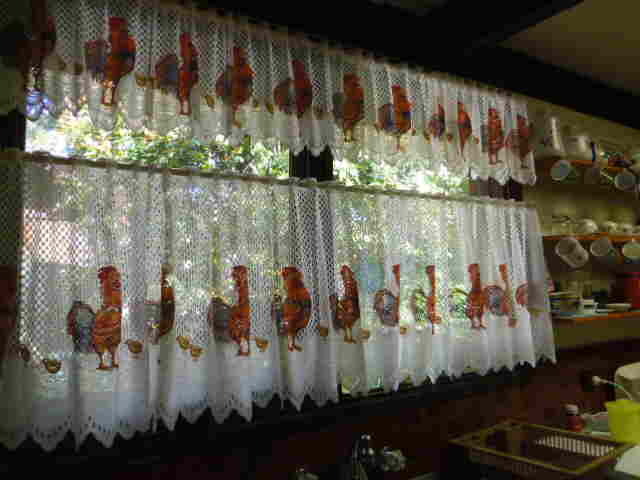 She bought some curtain material to make curtains for her kitchen, but it didn't fit, so knowing we love chooks as much as them, she asked if I would like it. As all the curtains in our house are the original ones when we bought the house over 30 years ago, the thought of ANY new curtains sounded great, so I accepted her offer. She came here this week and within an hour had taken down the old curtains and fittings, installed the new fittings and rods, and hung the curtains! Don't they look gorgeous?? She wouldn't accept any payment, so I gave her some chook patchwork fabric from my stash that she liked. She said she just likes to make her friends happy. Isn't that what a good friend does best? I'm very fortunate to have friends like Cheryl; all my friends make me happy in different ways. Some make me laugh, others make me think deeply about life, and some teach me new things in the way of crafts. I love 'em all! The curtains are great. Look really nice. What a great gift from a great friend. Hope all is well with you both. We are up in toronto visiting family this week. Must get back to my blog when I get back. 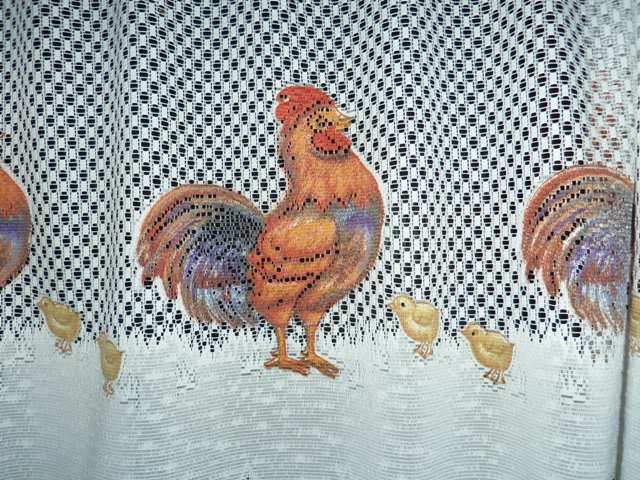 Dear Gina ~~ I love the rooster curtains, they are lovely and I love chooks too. What a lovely gift from a friend. It is lovely to have friends who swap things around. Thanks for the comments on y blog. I guess we are all pending and one never knows who will go next. You liked my carpet of mauve. There are still plenty on the wisteria, where I prefer them to be. Take good care of yourself and Ken. I hope you are both all right at present.